These Westside moms get our vote for coolest moms on the block. 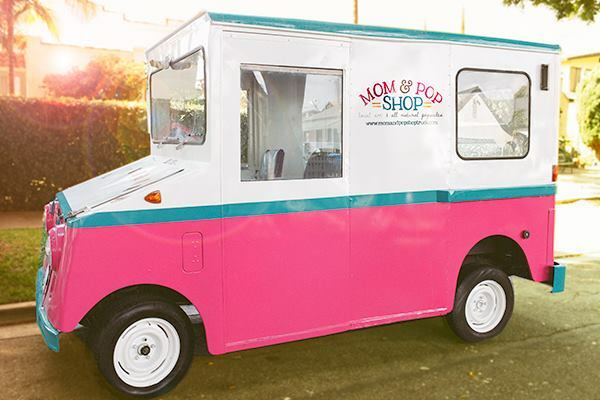 They had a sweet idea to make delicious, nutritious popsicles and deliver them to kids of all ages in their new Mom & Pop Shop Truck. "Our mission with the pops was to offer a healthier, minimally processed, kid-friendly alternative to what was currently being sold off of ice cream trucks," says Bernie Dickson. "We just wanted to think creatively about the traditional frozen treat and eliminate the refined sugar while incorporating some unconventional ingredients, like veggies, and still have kids and parents alike say, 'Wow! That’s yummy!'" Brilliantly timed with this persistent heat wave, the roving popsicle stand, a converted mail truck from the '70s, began its roll-out during the past couple of weeks at catering events. Check out this slideshow from mom-to-be Julia's "little pumpkin" baby shower. The idea for Mom & Pop Shop came to fruition when Dickson and her working-mom friends Angie Martinez, Lani Phillips, and Julia Yacenda-Murphy wanted to get away from their computers and enjoy more quality time with their kids: "We thought, 'What better way to work, offer a healthier alternative to treats and have fun with our kids?' Two of us are also artists, so we want children to have the access to learn about art." In addition to the tasty, all-natural pops, which come in flavors such as Mexican Hot Chocolate, Arnold Palmer, and the Agua Pop (watermelon, watercress and lime), Mom & Pop Shop also serves up local artwork. Each popsicle comes with a limited edition mini art print. Kids collect them like baseball cards, and larger prints are available for purchase on the Mom & Pop Shop online store. Prepare to be smitten with the "Venice Beach" and "Popsicle Truck" posters. A "Culver City Map" illustration is in the works too. They also have a popsicle book for youngsters, which helps them learn colors with "cool” characters. You can see them all here. In the coming months, they'll feature more fresh works from local artists on the truck, creating a roaming "pop-up shop." Venice art print by Bernie Dickson available at the Mom & Pop Shop online store. The vintage truck was a Craigslist score from Mission Viejo that, from the start, was a labor of love. It needed total restoration. It barely made the trip home, says Dickson, and sourcing the parts was a major challenge. "Now that is it finished, we are so happy with the outcome," she says. "We definitely called in a lot of favors and are so thankful to all those who have put in their time and energy-especially our families who helped us literally sand down the back door to get to its original wood. Our kids adore it and love pretending to sell popsicles out of the little window." Expect to see Mom & Pop Shop at local farmers' markets and other events in the near future. They'll be posting updates to their website and Facebook page. In the meantime, they're ready to cruise over for your next private party. Pops range from $3 to $5, and they're available to cater events throughout the Los Angeles area. So what's been the biggest treat of all with this new venture? "Hmm, that is a good one," says Dickson. "Although we love creating new art and getting in contact with local artists, we could all agree that it would be eating the popsicles. We have been experimenting with recipes, and in this heat, it has been so much fun having 'tasting' parties to tweak them to our likings. And the kids LOVE the idea, so it has been a blast having them taste the pops and 'trick' them into eating healthy treats. (The strawberry one has spinach in it!). Oh yeah, and having the truck start, that was the most victorious moment!"